Instead of throwing a Super Bowl party this year, our priorities for the weekend have shifted slightly. My friend's are throwing me a baby shower on Saturday. Yay! I'm very excited!! I made the announcement I was expecting this Spring on my Instagram, but I hadn't made any official announcement on the blog, until now. 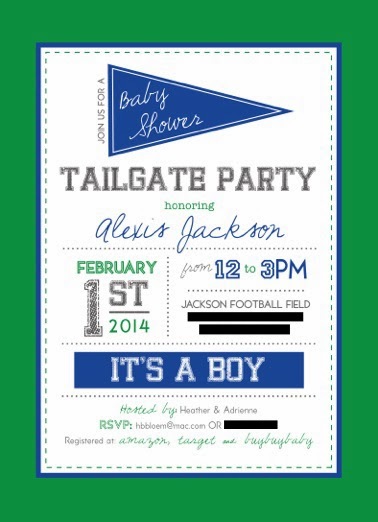 Since we are expecting a boy I wanted to go with a football and tailgate themed shower. What can I say, I guess I am predictable. My very talented friend, Heather with Design Roots, created these super cute shower invites and she also designed a lot of the fun decorations for the shower, that I will show you guys next week. For now, I will leave you with the menu for the party, because I think a lot of the items could be made on Sunday for the big game. I had a good friend make a tailgate/football themed cake and we are also serving blondies made in my favorite football shaped Wilton molds. I hope everyone has a great Super Bowl weekend! It should be interesting with the weather. congrats!! hope you have a great baby shower and have fun watching the super bowl!